Some like it hot, Salsa that is! What is a burrito without salsa? I’ll tell you, it’s a burrito that is missing something MAJOR! Well tonight I am giving into my cravings and making burritos for dinner, but I can’t find a low-Fodmap salsa to save my life. Onions and garlic are the main issues. But as I have also figured with Barbeque Sauce and Ketchup, I have to make my own. I have not been 100% successful on the previous ones, but I made a good Salsa so I’m going to write up that recipe. Add all ingredients, including juice from the tomatoes and chilies into blender and blend to your liking of chunkiness. Let it sit in the fridge for a few hours for flavors to settle. I can’t wait, I think this is going to be a good burrito! I adore my time with my girlfriends more than I can say. This weekend we had our bi-yearly get away but because we are in the NW we got snowed in, unable to make it over the penninsula. SO, we made the best of it and stayed at one of our lovely homes…on a houseboat! Every time we do one of these weekends, all 5 of us each make a different meal/course and we all share food, drink wine, play games, laugh, chatter, discuss and did I mention laugh? Well lucky me, I have fantastic friends that also work with me on my dietary issues and always make things I can eat as well which is no easy feat. This weekend had three lovely treats involved, but I only have one recipe at this point. I’ll share the others because they were all fabu. We had Banana Bread, Mojito Sorbet and Shrimp Scampi! Yeah, seriously… my friends are AWESOME. Add peppers and onion to skillet, saute them together until the onion is trasclucent and the peppers are tender. Add tomato sauce and parsley and stir them in well. 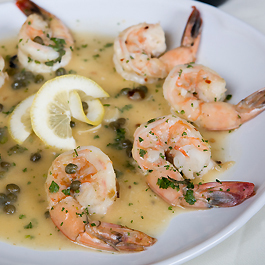 Return the shrimp to the pan, cover and simmer for two to three minutes, Sprinkle with salt, pepper and capers. FODMAP Bars? Yes please I’ll Love my guts!